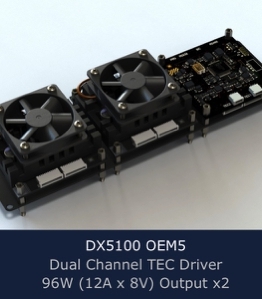 DX5100 OEM TEC Controllers (Peltier Drivers) represent a family of precision-programmed devices with PID temperature regulation and PID Auto-Tune for thermoelectric coolers ( Peltier modules) management and efficient operating. 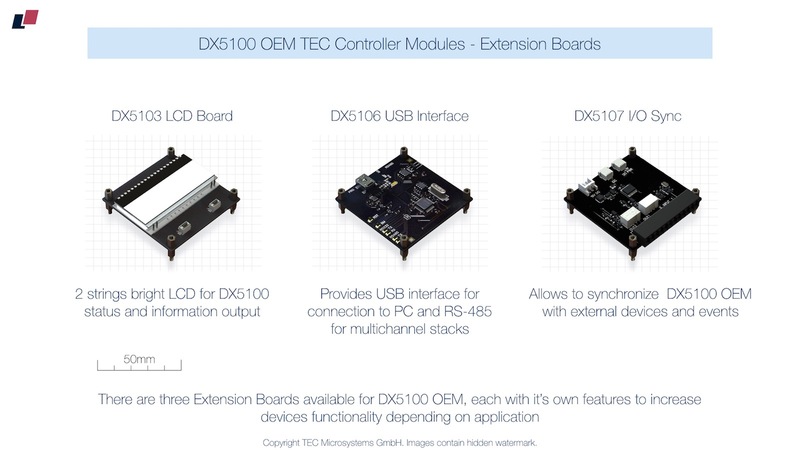 DX5100 OEM TEC Drivers are based on modular concept, which means DX5100 OEM device consists of multiple boards, each one with it's own functional features. 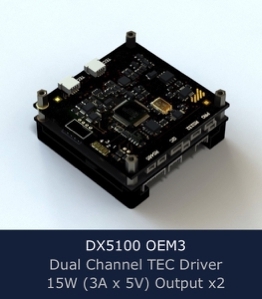 The "think tank" or the brain of DX5100 OEM Peltier Controller is CPU Board DX5101, to which one or two Power Boards can be connected. 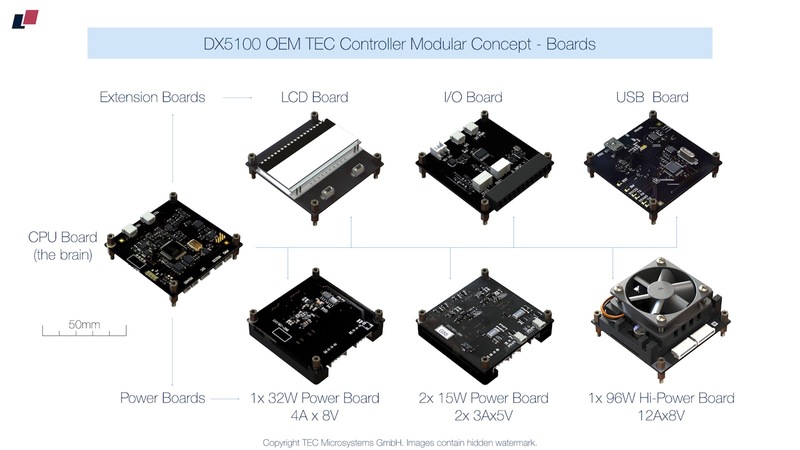 CPU Board and Power Board(s) form the core of DX5100 OEM TEC Controller device. Additional options can be added using extensions boards. 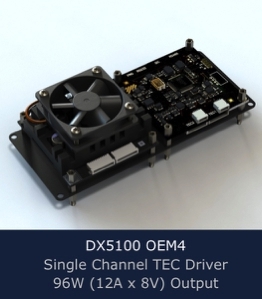 There are five base DX5100 OEM solutions, classified by various power output (current x voltage) and number of channels: OEM1, OEM2, OEM3, OEM4 and OEM5. The choice (from two possible values) of the thermistor measuring current is stipulated. Thermistor measurement current can be 84μA or 1μA. For the resistance values up to 11.9kOhm DX5100 uses 84μA measuring current. For larger temperature sensor resistance values (up to 996kOhm) 1μA measurement current is applied. 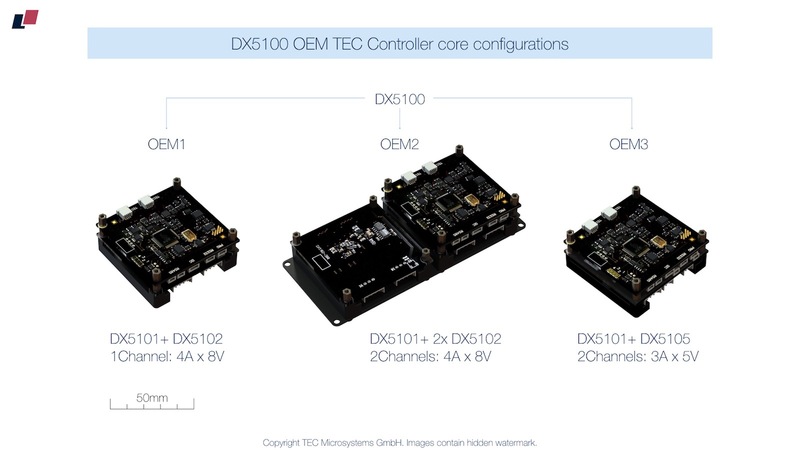 DX5100 TEC Controllers have a unique ability - each DX5100 controller can be connected in a stack (array) with another one. It is possible to create a stack solution with up to 128 channels with a control from one PC. 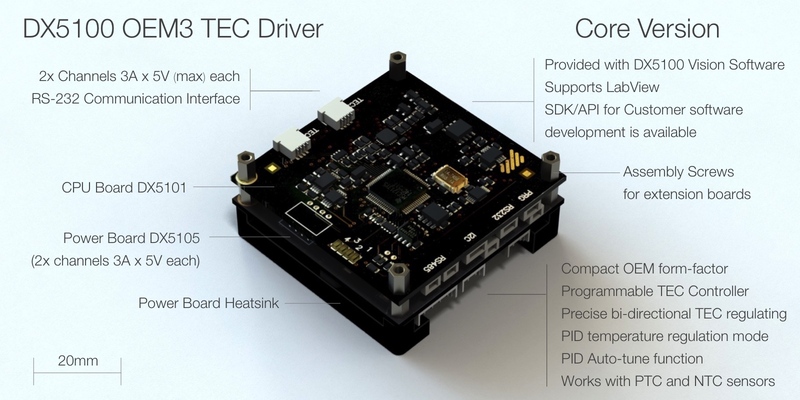 The stack configuration can be assembled by Customer himself from multiple DX5100 OEM Controllers or pre-ordered initially. In such stack the master device to be equipped with DX5106 Interface Board and connected to PC (via USB interface). 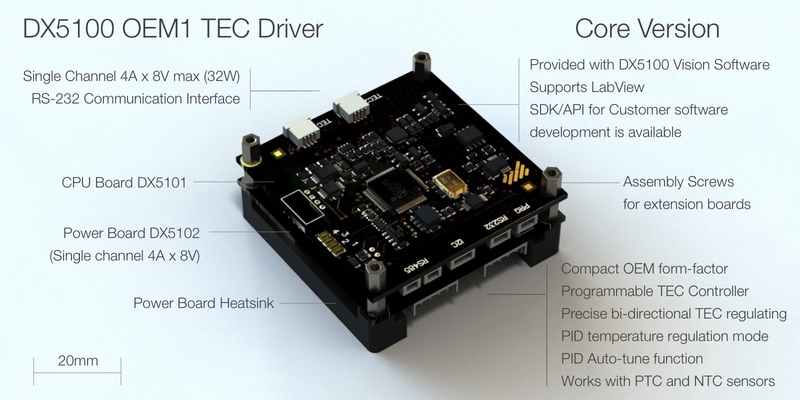 All other devices in stack are connected to the master device by twisted pair and communicate via RS-485 interface port on the CPU board. The connection to PC is required for initial setup and programming. 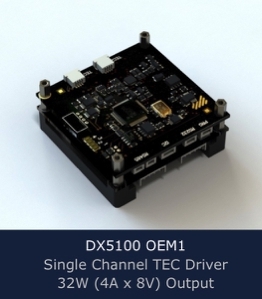 After setup DX5100 stack can operate stand-alone, without connection to PC. 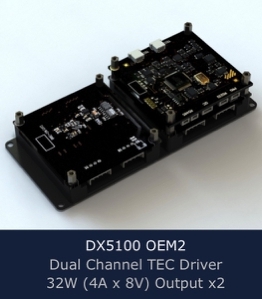 DX5100 TEC (Peltier) Controllers, connected in stack, are ideal for quick and simple assembly of multi-channel TEC systems in R&D and reliability research applications. 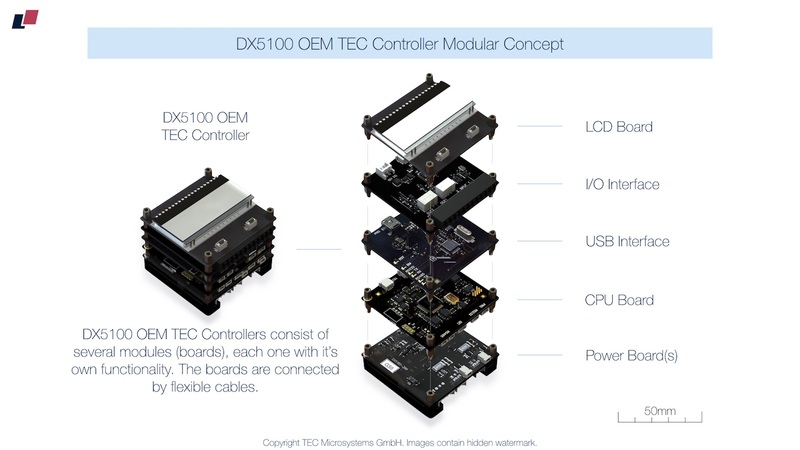 Modular concept is the one of DX5100 controllers key features. There is a main CPU board and a set of modules to attach to it - power boards with extension boards. CPU Board and Power Board(s) form together a core OEM model. 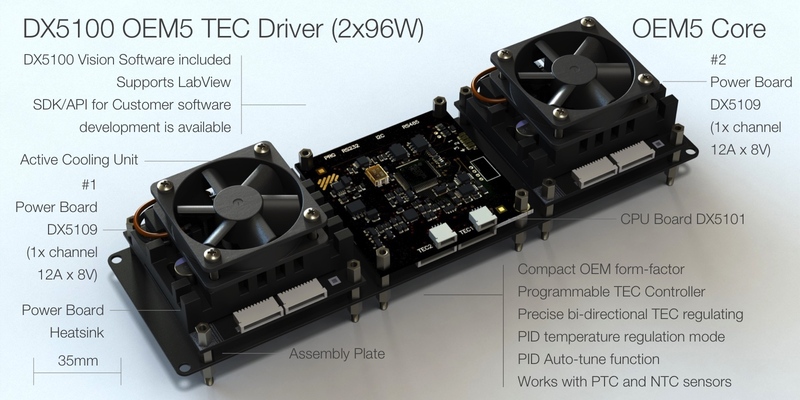 There are three base thermoelectric driver Power Boards with 15W, 32W and 96W output per channel. 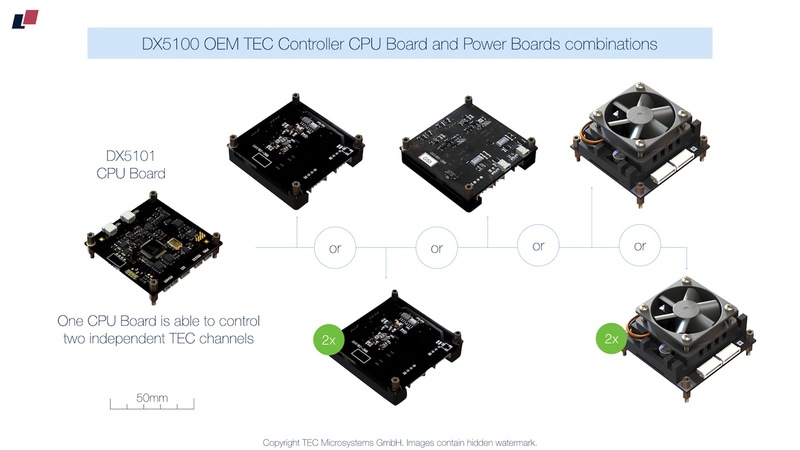 One CPU Board can control max two independent TEC channels at once. 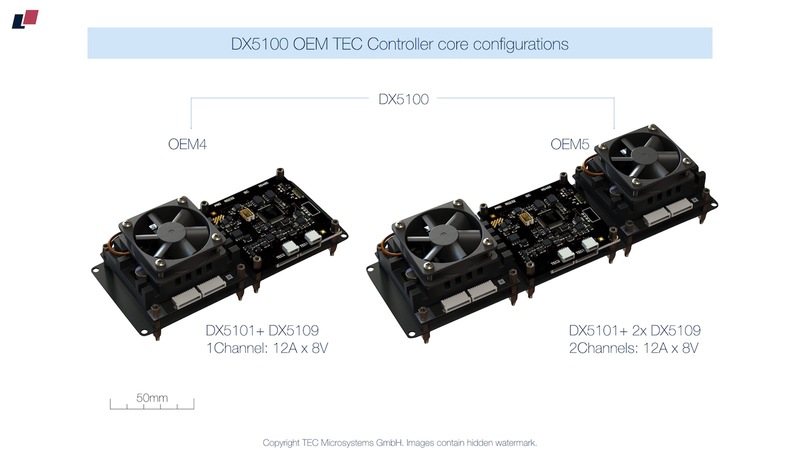 There are five core OEM models, depending on power output and number of channels. 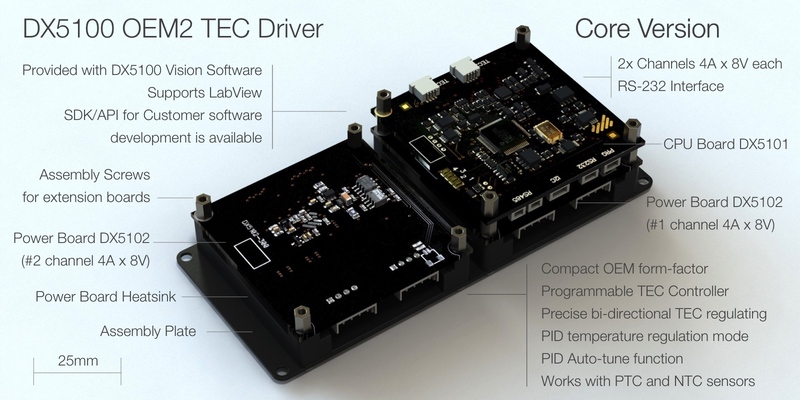 The core OEM model can be equipped with three additional extension boards to increase TEC driver functionality and add additional features. 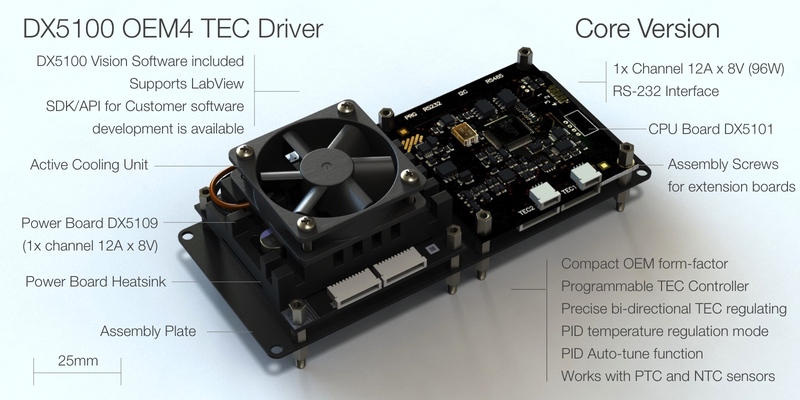 Each board is connected to CPU Board with a flexible cable, which provides great flexibility with DX5100 boards assembly and placement inside a final device. 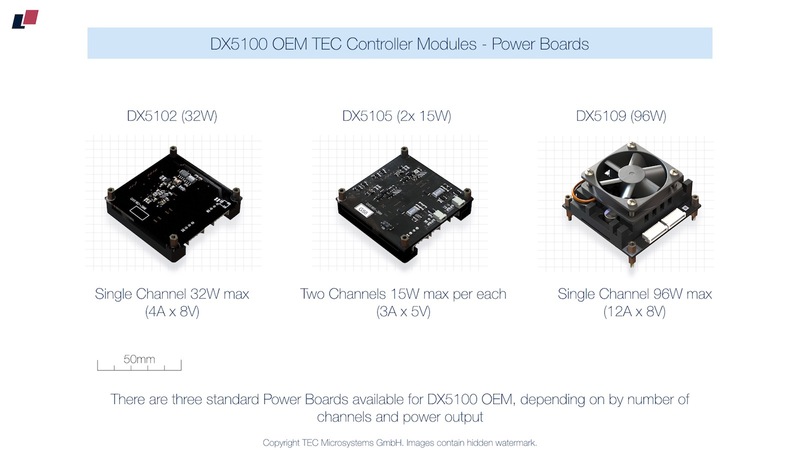 Please, select the required core OEM model below to see the list of available DX5100 OEM configurations.